Hey, look what I found on the beach! 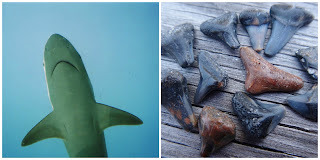 Fossilized sharks teeth! For millions of years, sharks have lived and died in the Gulf of Mexico. Dead sharks sink to the ocean floor where they are covered by layers of sand and silt. Over time, the cartilage of their bodies disintegrates. Water and storm action eventually sweeps the sand away, exposing the teeth. Some are washed up on shore with the changing tides and waves. Sharks may have up to 3,000 teeth at one time. The teeth are arranged in rows and when one tooth is damaged or lost, it is replaced by another. Their teeth are constantly replenished and have unlimited rows of teeth to replace others (they are polydonts). Most sharks have about 5 rows of teeth at any time. These ones are quite small, most are approximately 10mm. I’m looking for a larger one, in good shape, to cast into sterling silver. Collecting treasures. And being really happy that they are prehistoric sharks.